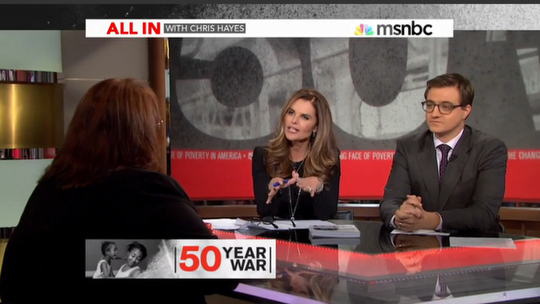 Maria Shriver joined Chris Hayes for a special edition of “All In” on Monday covering poverty in America. 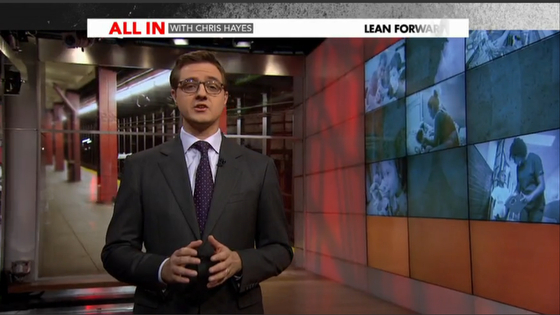 For the special, MSNBC changed up the graphical look and pulled out some camera tricks. 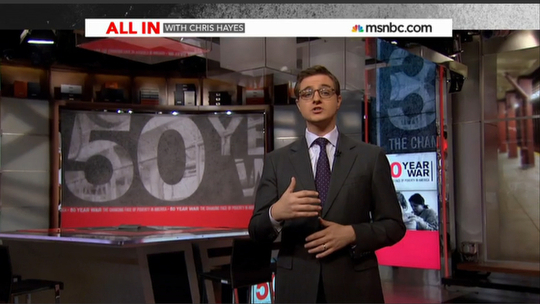 For the show’s opening, Chris Hayes and the camera rotated from the monitor wall to the projection screen, creating a unique effect. Was it necessary? Not really, but it added something to the special edition’s production value. Gobos added extra texture to the set’s walls while a dura changeout replaced the Rockefeller Center interior photo with a more gritty subway platform image, its red metal pillars complementing the rest of the look. Graphically, the special recolored the graphics to red and grey from the normal hues of blue and orange. An informal interview area was also created, using the vertical monitor wall with photos added. Red gobos projected effects on the backlit panels, which appeared to be turned off. 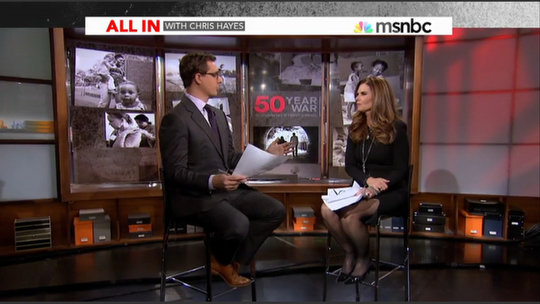 Hayes’ normal desk was used, but Shriver joined him for interviews. Overall, it’s interesting what a few simple changes can do to a set.